A perfect gift for the whiskey lover, this Scotch Glass and Arctic Rocks set comes with 4 Glencairn Wide-Bowl Whisky Glasses and a set of 6 Arctic Rocks for cooling your drink without diluting it. Whiskey Neat, But Still on the Rocks. A Special Holiday Pairing. Finally—No matter how you spell it, Whisk(e)y on the rocks—no melting! 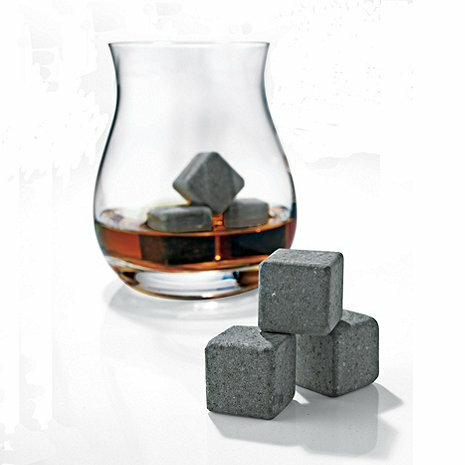 These ice cube alternatives are made from hand-cut granite, and keep whiskey cool without ever diluting it. Effective at retaining temperature for extended periods of time. Safe, natural, non-porous, odorless, and flavorless. Includes travel pouch. Rinse before use. Store in the freezer for at least 4 hours before use. Add 3 stones to a glass. Pour until liquid has reached the height of 1 stone (about 2 fl. oz.). Let stand for 5 minutes. Enjoy. Rinse after every use and air-dry. Store in the freezer for next time. Do not chew or ingest. Intended for Whiskey and others spirits (such as Tequila, Gin, and Rum) only. Not intended for large volumes of liquid such as pitchers of iced tea or lemonade. Will not inadvertently scratch glass. These glasses were purchased as a gift along with the Madison Avenue decanter, and they complement each other very well. They are very nice glasses and my husband loves them. Nice glass, but don't like maple leaf. I use these for scotch & Bourbon. I never drink Canadian whiskey, so the maple leaf limits the usage of the glass from a style standpoint. The glasses are great but the rocks move around too much in the glass. They do not chill effectively for me.. I would not purchase again.